​At first glance this verse is lovely. Who wouldn’t want to be a light? Who wouldn’t want to take the love of Jesus to the ends of the earth? It inspires a big “yes” in my spirit and soul. And it should! Our spirits were created to say “yes” to this. When we dig deeper into the verse we discover from the context that Paul and Barnabas are in Antioch of Pisidia on their first missionary journey. They were most likely sent there after visiting Cyprus. When they arrived Paul was invited to speak in the temple. The message was full of wisdom and insight. The message tied their religious history with the redemptive relationship in Christ. The congregation and Jewish rabbis were moved. They were asked to return the following week. The King James version records that “almost the whole city” came out that second week. Can you imagine the power and love in their message that the whole city would show up? There are 3 responses to the situation in this story. First, the God-fearing leaders and many in the town came to faith in Jesus. They heard the message and received its gift. They rejoiced in the Messiah and were filled with the Holy Spirit. This was the plan. The results were similar to their earlier visit to Cyprus. Many believed. The text also tells us the message was spreading throughout the whole region. Second, the Jewish leaders saw the crowd that showed up for the good news and took offense. They incited the influential men and women against Paul and Barnabas. They felt threatened and humiliated that their guests had won over the people of their city. They wanted these two men gone. Third, Paul, Barnabas, and those traveling with them shook the dust off their feet and left for Iconium. They were not rejected, offended, or fearful. The text tells us they were filled with joy and filled with the Holy Spirit. The Jewish leaders had missed it. They had missed the One they were waiting for because they had lost sight of who they were. They were God’s chosen people, the light through whom salvation would come. (Isaiah 49:6) It had come, and the message was presented again, and they still missed it. They missed it because they didn’t understand how to be a light. 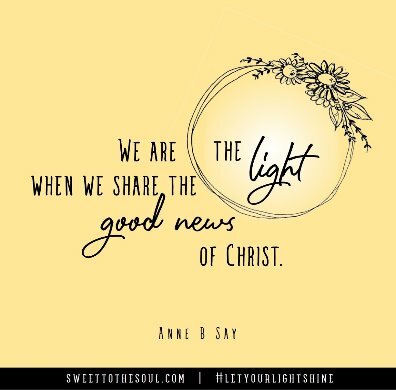 ​We are the light when we share the good news of Christ. ​Paul knew his calling. He knew what he was called to do, and he did it. As he traveled, he always went to the temple and shared, then he went to the Gentiles and shared. Paul took advantage of every circumstance and situation in which he found himself. He shared the good news of Christ with each person who crossed his path. ​We are a light when we know our identity and work together. 2000 years ago the people in our text struggled with comparisons. Fast forward to today with social media and 900 television channels showing us how we can decorate our homes, live our lives, and take our careers to the moon and back without breaking a sweat. Comparisons never end well. They are indicators that we’ve confused our identity. Comparisons prevent us from being a light. God has called us each to a purpose. He prepared specific works for us to do. It is through our unique purposes that we are a light to the world, that we bring salvation to the ends of the earth. We are all created with a unique design and purpose. The fullness of who we are, our quirkiness, our passions, skills, even our experiences are all designed to equip us to do the work that our heavenly Father has called us to do. Ephesians 2:10 explains that those works were planned for each of us before we were born. 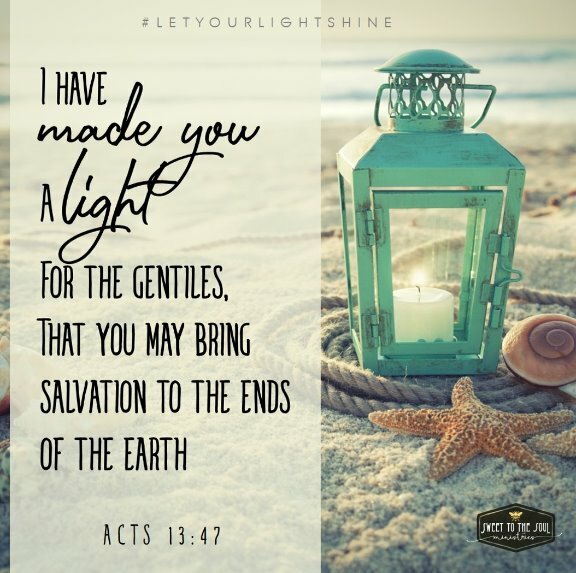 We are called to be a light through who we are and how we use our uniqueness to share the good news. 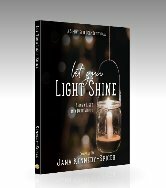 Our skills put us in places where Jesus needs us to be a light. Our experiences help us relate to people who need an encounter with Jesus. Everything can be used by Him to bring salvation. ​We are a light when we choose God’s power through Holy Spirit in us. The Jewish leaders in our story became offended at the city-wide turnout to Paul and Barnabas. They were operating in their own strength. Paul and Barnabas were operating in God’s power and many came to salvation. Jesus gives us the Holy Spirit so that we can do exceedingly more in His power than we can in our own strength. The reason everyone showed up the second week was because they were looking for some good news. The reason everyone was filled with joy is because they were filled with the Holy Spirit. The Jewish leaders in that city couldn’t bring that because they didn’t have it to bring. ​Anne B Say is a natural encourager. Over several decades Anne has traveled throughout the United States, Europe, and parts of Central America. She has been a single mom and a teacher, and understands the challenges of balancing work and home in a pressure-filled world. Her passion is to help others find freedom, peace, and experience all the goodness that life has to offer.